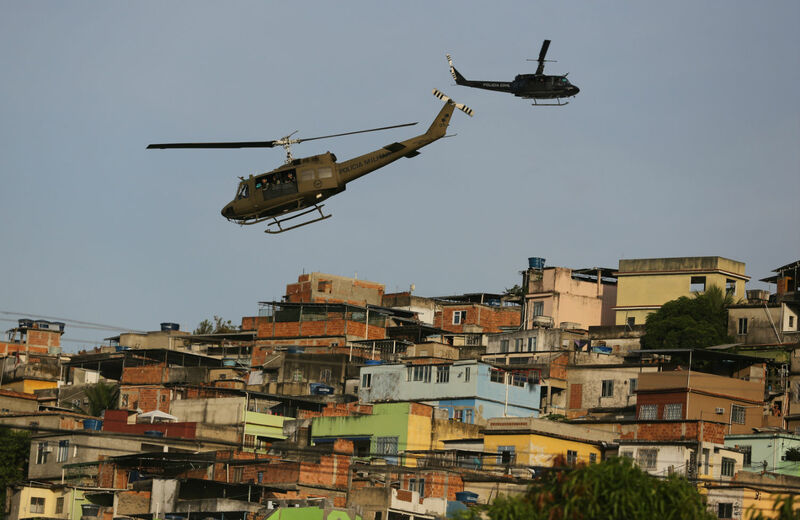 Why Is Blackwater Helping to Train Brazil’s World Cup Security? It was revealed this week that the company Academi—the rebranded private militia once known as Blackwater—has been providing security training for the 2014 World Cup. In news as shocking as it was unreported in the United States, the Brazilian press revealed earlier this week that Academi—the rebranded private militia once known as Blackwater—has been providing security training for the 2014 World Cup. The notorious company, responsible for the 2011 Nisour Square massacre in Iraq, has been training Brazilian security forces in North Carolina. Hosting mega-events comes with astronomical costs. This summer’s World Cup in Brazil is the most expensive ever, with a tab so far of $11 billion to $13 billion. These costs promise to catapult even higher as unfinished projects linger long after the soccer fans have returned home, with some estimating the final price tag to crest at $15 billion. In addition to being the most expensive, the World Cup organizers plan to deploy more force than any previous tournament. More than 170,000 security personnel from the military, police and secret service will be on hand, 22 percent more than worked the previous World Cup in South Africa. Now we know that some of these forces will be trained by a private security firm with a dodgy history. In Rio, the “pacification” of favelas is already hurtling ahead full throttle. Amnesty International described the Pacifying Police Unit’s recent incursion into the Maré complex of favelas as “a military occupation.” The suspicious disappearance of a young man named Amarildo Dias de Souza from his home favela of Rocinha sparked a public outburst and media-led investigation that spurred criminal charges against the neighborhood’s commanding officer and his minions. The security officials sit in prison awaiting trial, accused of torturing De Souza to death and discarding his corpse in the jungle. Not surprisingly, a recent national poll found that less than a quarter of Brazilians trust the police. The conflation of terrorism and activism is also rampant. Lawmakers in Brazil are angling to use the state of exception that sports mega-events inevitably bring to pass drastic legislation. The Brazilian Congress is contemplating an antiterrorism bill that would impose hefty sentences—fifteen to thirty years in prison—for “causing or inciting widespread terror by threatening or trying to threaten the life, the physical integrity or the health or liberty of a person.” Human-rights groups have clamored that such proposals are overly broad and could be used to squelch all kinds of protest and actions during the World Cup. For security mavens, Academi’s involvement training Brazilians at its company headquarters in North Carolina may come as no great surprise. After all, Wikileaks revealed in a 2009 cable from the US Embassy in Brasilia that the US government views the crises brought on by hosting sports mega-events as prime occasions to cash in. After power outages rippled across Brazil in 2009, the US Mission wrote, “The newly heightened concerns about Brazil’s infrastructure as a result of this blackout, combined with the need to address infrastructure challenges in the run-up to the 2014 World Cup and 2016 Olympics, present the United States opportunities for engagement on infrastructure development as well critical infrastructure protection and possibly cyber security.” In short, Brazil’s misery created room for opportunism. The cable encouraged US government agencies like the Department of Defense and Department of Homeland Security “to explore these opportunities in the near-term.” With Academi’s involvement in Brazil, this type of “opportunity” is taking shape. The indomitable critic Eduardo Galeano recently said of FIFA, the world’s governing body for football, “There are visible and invisible dictators. The power structure of world football is monarchical. It’s the most secret kingdom in the world.” People across Brazil concur—disgruntlement with Fifa’s arrogance and opacity is widespread. Earlier this month, a poll found, quite remarkably, that in the football-crazy country of Brazil only 48 percent of the population favors hosting this summer’s World Cup, plummeting from 78 percent support in 2008. Meanwhile, 41 percent actively oppose it, up from only 10 percent. Last summer, the 2013 Confederations Cup provided a prime-time dress rehearsal for principled dissent. Almost everyone expects cross-country protests at this summer’s Copa do Mundo. Under intense public pressure, Rio Mayor Eduardo Paes recently remarked, “We’re not going to build a Bird’s Nest [Stadium] in Rio de Janeiro. If you go to Beijing today, the Bird’s Nest has become a mausoleum to honor wasted public money. We are not going to do this here.” The mayor was right about the perils of white elephants. But another threat lingers: the intensified militarization of public space in the name of protecting the sports spectacle. Now it looks like private security firms like Academi are in on the deal, and that’s unsettling for anyone not under the spell of historical amnesia.